Many of the near-600 British veterans who were successful in this month’s British Masters Championships at Lee Valley, north London, are splashing the cash again to travel out to Daegu in South Korea for the World Masters Indoor Championships from March 19-25. 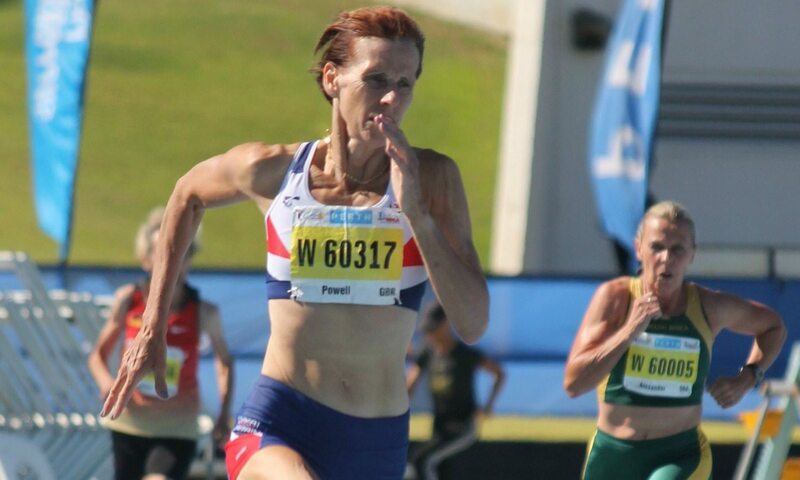 Caroline Powell (pictured) set a W60 400m world record when joining her age group a couple of years ago and – after competing in the three sprints in the British event – she heads the British women’s challenge in Daegu, alongside Carole Filer. Powell will face Canadian Karla Del Grande, who is ranked just a fraction slower over 200m but looks favourite over 400m. Also in the W60 group, Filer goes in five jumps and hurdles as well as the pentathlon. Hurdlers Joe Appiah (M45) and Neil Tunstall (M55) add to British strength over the barriers, with Tunstall also taking in the 200m/400m double. Mensah Elliott, meanwhile, is down for the M40 hurdles. Jason Carty is the fastest entry in the M45 flat 60m with Appiah a tick slower. The women’s sprint entries show Averil McClelland among the fastest in the W55 group as Michelle Thomas is ranked second to Australian Janelle Delaney in the W45 200m. Paul Delaney and Kevin Burgess top the M55 and M60 200m entries, while Tam Ossei is the quickest entry in both 60m and 200m sprints in the M40 group. Over 400m, David Elderfield tops the M60 entry lists. The women’s over-65 section is strong and Caroline Marler is ranked behind Jeanette Flynn of Australia over 400m. Flynn also heads the 800m W65 entries with 2:42, ahead of Ros Tabor and Marler, but Tabor but should have an easier passage in the 1500m. The 800m has Louise Rudd up against Emanuela Baggiolini of Italy in the W40 group while Joan Howe heads the W60 lists. In his new M55 group, Guy Bracken could be pushed by Frenchman Dominique Delbe in the 1500m but heads the times in the 3000m. Also in the field, W40 Ayamba Akim heads the high jump entries, as does Filer in the W60s. Up the age groups, Tony Bowman is the fastest M80 hurdler entered and goes in four more events including the pentathlon, while Charles Eugster is one of three M95s in the 60m. Britain’s walkers are led by M65 Ian Richards.